Multi-purpose 3-channel mixer and high resolution (24-bit 192 kHz) 2-track audio recording /playback computer interface (MAC or PC). Includes Cubase Al (downloadable version) recording/midi-sequencing software. 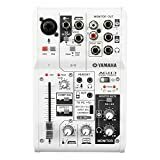 Yamaha AG03 3-Channel Mixer/Interface 4.4 out of 5 based on 34 ratings.